In Mark 11:15–19, Jesus returns to the temple to cleanse it the day after his triumphal entry into Jerusalem. Part of the corrupt situation he finds involves race-based systematized injustice. While the religious leaders protected the peace of the inner courts where Jews prayed and worshiped the Lord, they brazenly turned the court of the Gentiles into a noisy smelly livestock exchange and marketplace because of racialized bitterness. Jesus smells the ethnocentrism and the injustice, and it infuriates him. I began this way because I want you to know it’s right and good for us to be talking about ethnocentrism and racism in the church. Jesus still sees it, and Jesus still hates it. But our hope is that Jesus still cleanses it out of his church. And, despite our historic failures and present struggles, Jesus will make his house a house of prayer for all nations. I think the very question we’re considering today is evidence of that work. Is Black Lives Matter the new Civil Rights Movement? This is a well-formed question because it reveals that some of us are ready to talk about how racialized injustices affect the church, not just from the safe distance of 60 years ago but also today. We have a sense of angst because we know our failure to speak and act in the face of blatant race-based injustices 60 years ago has had a devastating effect on the local church today. Our denominations, churches, and seminaries continue to reveal patterns of ethnic homogeneity and exclusivity that do not fully express the glory of the unity for which Christ prayed in John 17, and defended in Mark 11, and for which he died. Racial hatred and disobedience has often gone unrepented, unchecked, and in some cases even more deeply entrenched in the church than in the world. (We all know some of our churches can be dangerous places for people of color.) Liberal churches and seminaries are lined with the casualties of conservative hypocrisy, as morally conscious young people and many ethnic minorities look for theologies with a robust enough social ethic to speak to the obvious suffering they experience and see all around them. This is the fruit of simply ignoring these issues. Refusal to address racialized sin has undermined our capacity to fulfill our Romans 12:15 calling to “mourn with those who mourn.” The unique calling of the church (as opposed to the institutions of the world) is not simply to tolerate one another, or even simply to understand one another, but to mourn with one another and bear one another’s burdens. To deliberately devote ourselves to listen to one another for understanding, and then to empathize with one another to the point of shedding tears with one another. That’s certainly not what so many of the talking heads on cable TV and talk radio are advocating. They’re not talking about mourning with those who mourn. But in the church, white suburban men are called to cry tears with the black inner-city woman scared to death her husband is going to be the next Eric Garner, or that her teenage son is going to be the next Trayvon Martin or Tamir Rice. And if you are so entrenched in your socio-political camp that you can’t shed some tears with Tanisha, something is deeply wrong. Because that’s who the church is called to be. That’s the kind of thing that makes our unity in Christ really conspicuous and causes people to see that there is a unique power at work in the church unlike anything in this world. And I hope that’s what our discussion about “black lives matter” helps equip us to do better. The one thing I remember from that evening, other than crying myself to sleep that night, was the way in which as a black person, I felt incredibly vulnerable, incredibly exposed and incredibly enraged. . . . It was a verdict that said: black people are not safe in America. When fellow activist Patrisse Cullors saw Garza’s post, she combined the now famous final phrase with a hashtag and began sharing it to foster a discussion about protecting the dignity and affirming the value of black lives. The next day, Garza and Cullors spoke together about organizing a campaign around the discussion. Finally, the two reached out to Opal Tometti, another activist they knew in the field of immigrant rights. The three women started by setting up Tumblr and Twitter accounts and encouraging users to share stories of why black lives matter just as much as any other lives. The slogan gained traction on social media, and with some initial gatherings, the Black Lives Matter protest movement we know today was born. The movement gained national attention about a year later when another unarmed black teenager, Michael Brown, was shot to death by a police officer in Ferguson, Missouri. The three organized a freedom ride to Ferguson to protest Brown’s killing under the auspices of the #BlackLivesMatter campaign. In the face of the social unrest that swept through Ferguson, the Black Lives Matter sentiment best captured the collective frustrations of the beleaguered black citizens of Ferguson and all over the country. Since then, more than a thousand non-violent protests have operated under the banner of the movement with chapters spread across approximately 30 cities. Is Black Lives Matter the New Civil Rights? The Black Lives Matter movement is best understood as one modern expression of a 350-year-old struggle to affirm the dignity of black life in a society that has systematically and historically denied it. This struggle has taken a variety of forms. However, the black church has been its most consistent champion, providing the theological foundation and often the only platform for the full affirmation of the humanity and dignity of African Americans. The most famous expression came during the Civil Rights Movement of the 1950s and ’60s. It grieves me deeply to say that King simply could not have attended conservative seminaries like The Southern Baptist Theological Seminary or Westminster. Since conservatives were not using their theological resources to affirm the equal value of black life, King critically engaged the liberal theological sources that were. Central to the Civil Rights Movement of the ’50s and ’60s was an acknowledgment of the full humanity of African Americans, a concept often known as “somebodiness.” In this way, Black Lives Matter and the Civil Rights Movement stand in substantial agreement as organized affirmations of black folks’ full humanity. Both movements dramatize injustices (through various forms of non-violent protest) to make the suffering of the oppressed visible and unable to be communally ignored. This was part of the genius of the Civil Rights Movement. During the advent of network television, freedom fighters staged non-violent protests in order to expose the daily indignities experienced by blacks all over the South. Images of Bull Connor’s fire houses, attack dogs, and billy clubs pummeling women and children exposed the true brutality of segregation. This practice was known as creative tension. Since deep injustices often hide beneath the veneer of normalcy, they needed to be exposed in dramatic ways. Through “die-ins” and other forms of creative protests, Black Lives Matter also dramatizes racialized injustices. Both movements see black liberation as a key to communal liberation for all peoples. They explicitly reject nationalistic ideologies, viewing oppression as damaging to the oppressed as well as oppressors. For both movements, injustice anywhere threatens freedom everywhere. Both movements officially reject social passivity on the one hand and violent militancy on the other. Both movements use non-violent direct action. There are some major differences, however. The Civil Rights Movement was birthed out of the black church, and its theological foundation was rooted in Scripture and the black church tradition. It held that God calls us to affirm the fundamental dignity of black life (as people made in the image of God) in our context and to oppose societal structures that denied it. The highest levels of the Civil Rights Movement were highly centralized within the black Baptist church with clear hierarchal structure comprising exclusively black male ministers. Although they provided much of the energy behind the scenes, women were often excluded from the highest public levels of the movement. For all its successes, a well-documented and troubling strain of male chauvinism marked the Civil Rights Movement. Black Lives Matter, on the other hand, prioritizes folks who have been historically marginalized in black liberation movements. It’s a self-consciously decentralized movement comprising mostly young black female leadership focused on voices outside the church or academia. In this way, Black Lives Matter is responding to the historic sexism that marked the Civil Right Movement. The Civil Rights Movement staged “perfect victim” cases in order to make suffering undeniable to those prone to ignore black suffering, criminalize blacks, and engage in character assassination. Rosa Parks wasn’t the first black woman to refuse to give up her seat on a bus in the South. However, she was carefully chosen because other victims would be too easily dismissed as somehow deserving the treatment they received. Black Lives Matter organized around what critics might call “morally ambiguous cases” to make its point. They insist that no one should be tried, convicted, and executed on the street. Extra-judicial killings constitute gross injustice and a disparagement of human life, regardless of the previous lifestyle of the victim. The Black Lives Matter founders, some of whom identify as queer and/or a sexual minority, list the affirmation and inclusion of LGBTQ individuals in their platform. The Civil Rights Movement did not. In sum, there are enough major differences to say Black Lives Matter is not an extension or rebirth of the Civil Rights Movement. Still, I strongly recommend full engagement with the concept and critical engagement with the movement, especially since there’s no evangelical alternative to Black Lives Matter. It grieves me deeply to say there’s no evangelical movement robustly, consistently, and practically affirming the value of disparaged black people. So we must be careful how we criticize Black Lives Matter in the absence of an evangelical alternative. There are enough major differences to say Black Lives Matter is not an extension or rebirth of the Civil Rights Movement. Still, I strongly recommend full engagement with the concept and critical engagement with the movement, especially since there’s no evangelical alternative to Black Lives Matter. It grieves me deeply to say there’s no evangelical movement robustly, consistently, and practically affirming the value of disparaged black people. So we must be careful how we criticize Black Lives Matter in the absence of an evangelical alternative. Like the Civil Rights Movement, Black Lives Matter addresses racialized inequities in the criminal justice system and policing, disparities in education and healthcare, mass unemployment and underemployment. The church cannot affirm their Black Lives Matter leaders’ view of sexuality. We must maintain a biblically rooted sexual ethic. Nevertheless, we must critically engage the ethical questions they raise and decry the injustices they’ve highlighted. The duties required in the sixth commandment are, all careful studies, and lawful endeavors, to preserve the life of ourselves and others by resisting all thoughts and purposes, subduing all passions, and avoiding all occasions, temptations, and practices, which tend to the unjust taking away of the life of any. I can’t even be a good Presbyterian unless I make a “careful study” of issues that tend to the unjust taking away of life! That means I can’t even be a good Presbyterian unless I’m carefully engaged with issues like the Flint Water Crisis, mass incarceration, disparities in housing and healthcare, and yes, police brutality. And then the catechism gets into our thought life. I have to “resist all thoughts” that could lead to the unjust taking away of life. Am I buying into the sinful belief that black folks are more inherently criminal than other people? When I hear about unarmed black people being killed, is my kneejerk reaction that they somehow deserved whatever terrible thing happened to them? Am I cold and hardened to black suffering? Why am I not as torn up over this as non-Christians are? Why is Black Lives Matter more torn up over black people dying than we are? The fact that Black Lives Matter leaders distinguish themselves from the church and has queer leadership is just an indictment against the evangelical church. They have more moral sense than we do! My wife has to beg me (a grown 37-year-old man) not to go out to Walmart at night, not because she’s afraid of the criminal element, but because she’s afraid of the police element. Because she knows that when the police see me, they aren’t going to see Mika Edmondson, pastor of New City Fellowship Presbyterian church. When they see me, they aren’t going to see Mika Edmondson, PhD in systematic theology. When they see me, all they’re going to see is a black man out late at night. And she knows we’re getting stopped at 10-times the rate of everybody else, arrested at 26-times the rate of everybody else, and killed at 5-times the rate of everybody else. Black Lives Matter can see the injustice in those statistics. 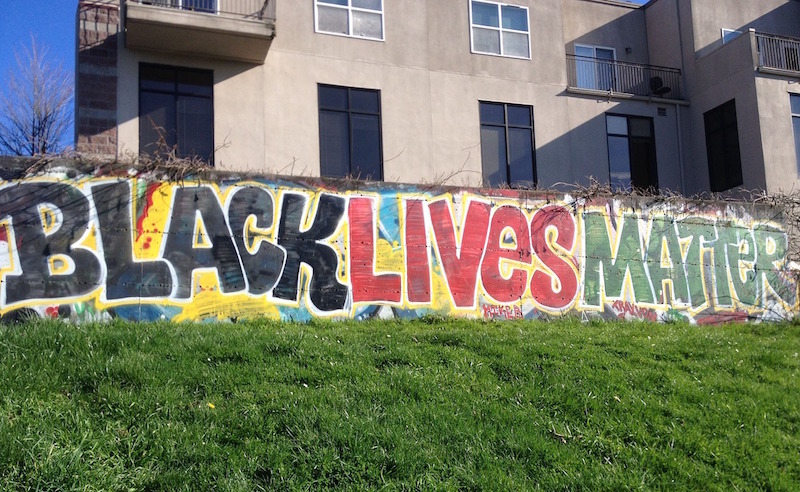 How can Black Lives Matter see the value of black life better than we can? Why does Black Lives Matter care more about the value of my life than you do? Why am I not as torn up over this as non-Christians are? Why is Black Lives Matter more torn up over black people dying than [Christians] are? . . . They have more moral sense than we do! How can Black Lives Matter see the value of black life better than we can? Finally, the Catechism calls us to act. Not just to think but to act, to “resist” any purpose that “tends to the unjust taking away of the lives of any.” So I can’t just study the issue and walk away saying, “Hmm, that was interesting.” If I’m going to be a good Presbyterian, I have to actually do something about these injustices. (You’d be amazed what’s in the Reformed tradition. Because it seeks to be a biblical tradition, it reflects truths that call us beyond our socio-political comfort zones.) So we should engage these issues not despite being Presbyterian and Reformed and Calvinistic, but because we are Presbyterian and Reformed and Calvinistic. There’s a reason many of us have not addressed these issues. We know well the cultural risks involved and the pushback we’ll get in our churches and institutions. It’s risky to address racial sin. If you don’t believe me, just ask Russell Moore of the Ethics and Religious Liberty Commission. Sin fundamentally twists the ways in which we view one another. Remember from Genesis 4 that sin so distorted Cain that he killed his brother in cold blood. And the first thing Cain did after killing his brother was nothing. He completely neglected the issue, as if it had no religious significance. He didn’t come to the Lord and repent. Cain thought he could sort of waltz back before the Lord and not have to deal with this sin, as if what he did out in the world had no bearing on his worship or relationship with God. But the first thing the Lord asks him is, “Where is your brother?” When it comes to race-based sin, people just don’t want to bring it up in the church. They don’t think it has religious significance. “What does the gospel have to do with that?” they will say. Or, “That’s politics, not religion. These discussions have no place in the church.” But we see that the Lord holds us accountable to be our brother and sister’s keeper and to repent where we have not. The first thing Cain did after killing his brother was nothing. He completely neglected the issue, as if it had no religious significance. When you bring up racial sin, people will say, “Why should I care about that? You are just playing the race card.” This is just a modern way of saying, “Am I my brother’s keeper?” We have a natural tendency to actively resist dealing with racial sin. How else can you explain a theology that comfortably co-existed with chattel slavery, the lynching tree, Jim Crow, segregation, and myriad ways black folks suffer today? How else could Jonathan Edwards and George Whitefield have had such great theology but think that it had nothing to say to the black suffering they saw all around them? (Edwards wrote copious notes on the duty of Christian charity to the poor on the one hand, while callously purchasing trembling little African girls off the auction block on the other.) Edwards and Whitefield were good churchmen, but that’s the theological equivalent of saying, “Am I my brothers keeper?” Evangelicals have a social ethic, but it’s a strangely selective social ethic. We show our feelings about the Lord by how we treat our neighbors made in his image. If someone broke into your home and defaced all your pictures, you wouldn’t say, “That person has a problem with pictures.” You would say, “That person has a problem with me.” The Bible often uses the second table of the law (the ethical side of theology) to show our commitment or lack of commitment to the first table (the epistemological side of theology). Despite the challenges, I think the church is called by God to critically engage and address the ethical issues and concerns related to Black Lives Matter today. Join ERLC​ and The Gospel Coalition​ at a special event, “MLK50: Gospel Reflections from the Mountaintop,” taking place April 4, 2018, in Memphis, Tennessee. Speakers include Russell Moore, Benjamin Watson, John Piper, Jackie Hill Perry, Matt Chandler, Eric Mason, Don Carson, and many others. The 50th anniversary of King’s tragic death marks an opportunity for Christians to reflect on the state of racial unity in the church and the culture. It creates the occasion to reflect on where Christians have been and look ahead to where we must go as we pursue justice in the midst of tremendous tension. Mika Edmondson is the pastor of New City Fellowship OPC, a Presbyterian church in Southeast Grand Rapids. He earned a PhD in systematic theology from Calvin Seminary and wrote The Power of Unearned Suffering, a book about Martin Luther King Jr.’s theology of suffering.